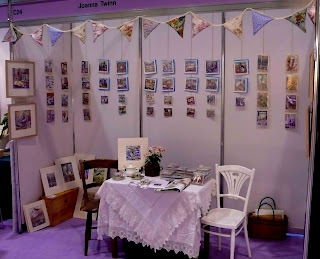 A big thank you for everybody who I spoke to, at my first ever trade show and K for all his help. We set off on Saturday for Exeter and I was feeling petrified, not really knowing what to expect. I will post the painting of the dog I was doing in the quiet moments very shortly, I just wanted to get a chance to finish it first. I should of got it finished but I was finding it hard to concentrate on all the detailed bits. Captain Rupert is very sad I did not post any Easter bunny messages from him. I picked him lots of extra grass and dandelion flowers to try and make it up for him. Its been wonderful to have some great weather over Easter. Its been so warm I was nearly tempted to join K sailing, but I did get some painting done instead. That's watercolour painting not gloss or emulsion although there is still plenty of that to do. 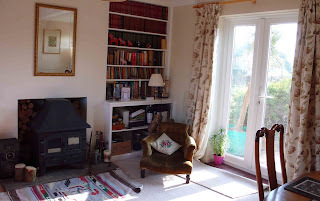 I have finally made curtains for the living room and the landing, K is very pleased - we brought the material in the sales in January. I just need to hem the patio door ones. The room feels so much lighter. Bedroom ones are next we just need to decide on the fabric. 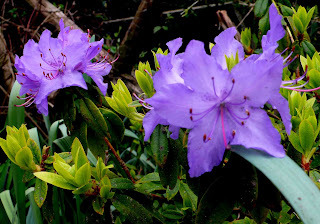 I have uploaded a few more pictures on flickr of the House and garden. 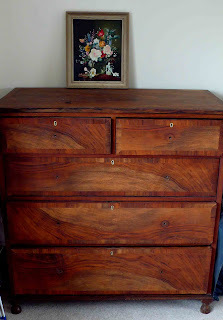 The chest of drawers that I striped is sitting happily in the bedroom looking so much smarter. It still needs some more wax on it and the handles replaced. The garden is proving to have one or lovely things in it. Its so exciting to see things come into flower. I just love this blue/purple. Not everything is quite so nice. 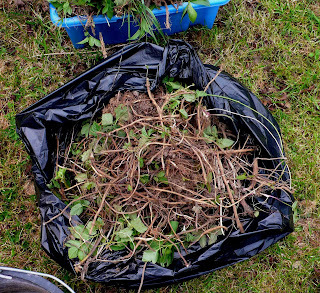 This is just one of the bags of ground elder that I have dug up. Its so horrid how it wraps itself around all the other plants roots, so they just don't stand a chance. I still have loads to dig up and I'm going to have to resort to some weedkiller, which is a shame as I would normally never use it.